That Colin Kleven sure gets around. The right-hander had a two-win week. The first came in Clearwater, Fla.
And the second was 1,259 miles to the north in New Britain, Conn. He was in the home dugout for the first and the visiting dugout for the second. First he pitched the Clearwater Threshers to a 3-1 win over the Daytona Tortugas at in Clearwater. Kleven (Kamloops, BC) fanned of six-consecutive hitters through the second and third innings earning the win as the Threshers clinched the North Division in the class-A Florida State League before 1,732 fans at Bright House Field. All-Star Kleven matched a season-high with eight strikeouts in his 5 2/3 innings, permitting two hits and three walks. His allowed an Alex Blandino solo homer in the sixth. Five days later, in his double-A debut he pitched the Reading Fightin Phils to a 6-1 win over the New Britain Rock Cats before 2,994 at New Britain Stadium. The win moved Reading into a tie for first place with New Britain in the Eastern League. The Rock Cats scored a run off Kleven in the bottom of the second inning on a RBI grounder by Jeremy Barfield to cut the Fightins lead to 2-1. Kleven pitched six innings allowing one run on three hits. He struck out four in his 79-pitch outing (57 strikes). He recorded six ground ball outs and five fly ball outs. Kleven limited Palm Beach to two singles in six innings in his Clearwater farewell before 289 fans the at Roger Dean Stadium. He struck out a season-high eight to move to 4-2 on the season. Palm Beach scored in the sixth on a lead-off single, a hit batter, a bunt and a fly ball. For his two-win week which consisted of two runs in 11 2/3 innings while striking out 12 earned Kleven Canadian Baseball Network Player of the Week honors for Week X11. Kleven beat out the likes of Adam Loewen (Surrey, BC) 4 1/3 scoreless at triple-A Lehigh Valley; SS Sean Jamieson (Simcoe, Ont.) .500 (7-14) at double-A Mobile, Terrence Dayleg (Burnaby, BC) .500 (6-for-12), one homer, four RBIs at double-A Jacksonville, Justin Marra (Toronto, Ont.) .500 (5-for-10) three RBIs at class-A Eugene, Dalton Pompey (Mississauga, Ont.) .476, homer, two RBIs at double-A New Hampshire. An interesting anecdote to be sure. The St. Louis Cardinals had sent Rowan Wick to Rookie Class Gulf Coast Cardinals as they are now converting him to a pitcher, after a pitching coach saw his strong arm from right field. This marks a second Canadian in 2015 involved in this type of conversion: Eric Sim a former catcher with the Giants is also now in the process of making a similar conversion. It will be interesting to see what develops for each of them. Last year the Chicago White Sox tried the same experiment with catcher Mike Blanke, and it didn’t work out very well, and it resulted in him being released. He’s back catching this season with Long Island Ducks in the Atlantic League. The “feel good story of the week” is Dustin Houle sent out on a re hab assignment by Milwaukee Brewers at Rookie Class Helena Brewers. He’s been inactive due to injury problems which included Tommy John surgery in 2014, since July of 2013, and is now finally ready to play again. Since being promoted by the Phillies to Triple A Lehigh Valley, Adam Loewen has carved out a niche for himself as the closer, and this week had three very good outings. On June 24th in a 5-4 victory over the Buffalo Bisons he pitched 1 2/3 scoreless innings, striking out three Bisons hitters to pick up the save. On June 29th in one inning of work, in an 8-1 win over Scranton Wilkes Barre in which he gave up no runs and no hits, but was not involved in the decision. On June 30th in a 12-8 win over Scranton Wilkes Barre he tossed two scoreless, giving up one base hit, while striking out four Scranton hitters to earn his second save of the week. His overall record for the season, including stints with both Double A Reading and Triple A Lehigh Valley now stands at 2-2, two saves and a 2.03 ERA. Another week, another win for Shane Dawson as he continues to perform at a very high level. On June 27th in a 5-1 victory over the West Michigan Whitecaps, he tossed 7 2/3 innings, surrendered only four base hits and one earned run, while striking out nine Michigan batters. This appearance improved his Single A Northwest League record to 10-4 with a 3.09 ERA. Colin Kleven had an excellent week picking up two wins, one with Single A Clearwater and another with Double A Reading. On June 24th in a 3-2 victory over Dayton Tortugas he pitched 5 2/3 innings, gave up just two base hits and one earned run, while striking out eight Daytona hitters, to earn the win. After this game he was promoted by the Phillies to Reading in the Eastern League. On June 30th he made his first start for the Fightin’ Phils and, in a 6-1 win over New Britain Rock Cats, he threw six solid innings, surrendered only three base hits and one earned run, while striking out four Rock Cats batters, to pick up the win. His overall record for this season including his stint with Single A Clearwater Threshers and one start with Reading, now stands at 6-3 with a 2.80 ERA. It’s a bit ironic in that his promotion to Reading, made it necessary for him to decline an invitation to play with Team Canada in the Pan American Games, to be held in Ontario this month. RHP Phillippe Aumont (Gatineau, Que.) - Cleared Waivers and refused assignment by the Phillies to Triple A Lehigh Valley Iron Pigs, and instead opted for Free Agency. LHP Rob Zastryzny (Edmonton, Alta.) - Chicago Cubs ended his Re hab assignment at Rookie Class AZL Cubs, and he was moved to Double A Tennessee Smokies. LHP Scott Diamond (Guelph, Ont.) - Moved by Tampa Bay Rays to Double A Montgomery Biscuits from Triple A Durham Bulls. 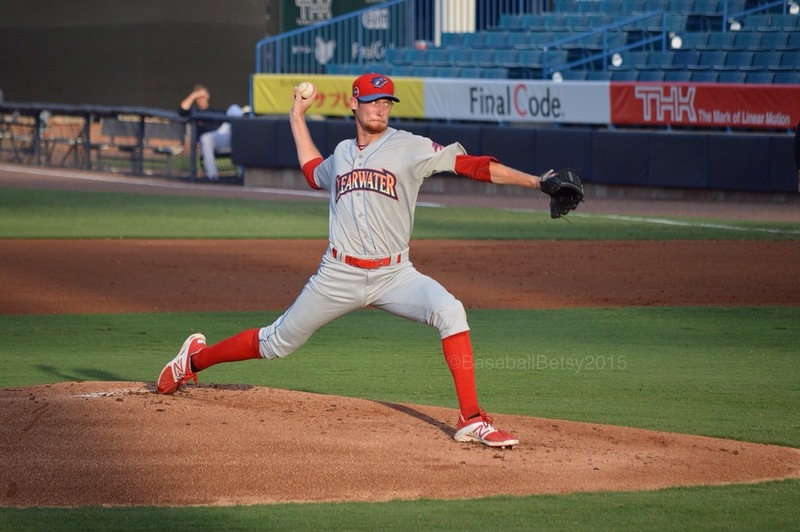 RHP Colin Kleven (Kamloops, BC) - Moved by Philadelphia Phillies to Double A Reading Fightin’ Phils from Single A Clearwater Threshers. C Jordan Procyshen (Calgary, Alta.) - Moved by Boston Red Sox to Single A Salem Red Sox from Single A Greenville Drive. C Dustin Houle (Langley, BC) - Sent out on Re hab assignment by the Milwaukee Brewers at Rookie Class Helena Brewers. LHP Ryan Kellogg (Whitby, Ont.) - 2015 Fifth Round Draft Pick activated by the Chicago Cubs at Single A Eugene Emeralds. LHP John McLeod (Calgary, Alta.) - Activated by the Baltimore Orioles at Rookie Class Gulf Coast Orioles. 3B Lachlan Fontaine (North Vancouver, BC) - Activated by the Seattle Mariners at Rookie Class AZL Mariners. 1B Josh Naylor (Mississauga, Ont.) - 2015 First Round Draft Pick agreed to terms with the Miami Marlins. Not assigned to an affiliate yet. C Chris Shaw (Winnipeg, Man.) - 2015 Fifteenth Round Draft Pick signed by the Baltimore Orioles. Not assigned yet to an affiliate. OF Michael Foster (Pickering, Ont.) - 2015 Sixteenth Round Draft Pick signed by the Chicago Cubs. Not assigned yet to an affiliate. OF Tristan Graham (Vancouver, BC) - 2015 Twenty Second Round Draft Pick signed by the Baltimore Orioles. Not assigned to an affiliate yet. RHP Reign Litkeman (Red Deer, Alta.) - 2015 Twenty Third Round Draft Pick signed by Tampa Bay Rays. Not assigned to an affiliate yet. RHP Jon Fitzsimmons (London, Ont.) - Free Agent signs with Quebec Capitales IND Can Am League. RHP Scott Richmond (North Vancouver, BC) - Free Agent signs with Wichita Wingnuts IND American Association. INF Jerome Duchesneau (Quebec City, Que.) - Free Agent re signs with Quebec Capitales IND Can Am League. C Joey Paciorek (Maple Ridge, BC) - Placed on the Disabled List by St. Paul Saints IND American Association. C/1B Josue Peley (Montreal, Que.) - Placed on the Disabled List by Quebec Capitales IND Can Am League. INF Nic Cuckovich (Victoria, BC) - Released by the Quebec Capitales IND Can Am League. RHP Rob Nixon (Welland, Ont.) - Released by Winnipeg Goldeyes IND American Association. So the draft didn’t turn out the way that you thought it would?